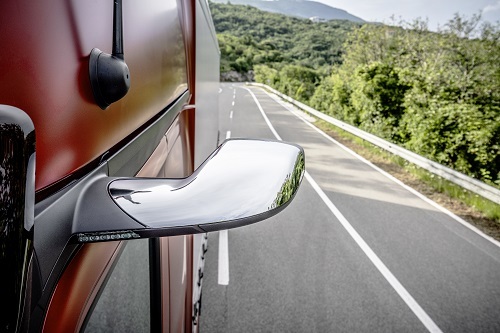 The new Actros without rear view mirrors ! 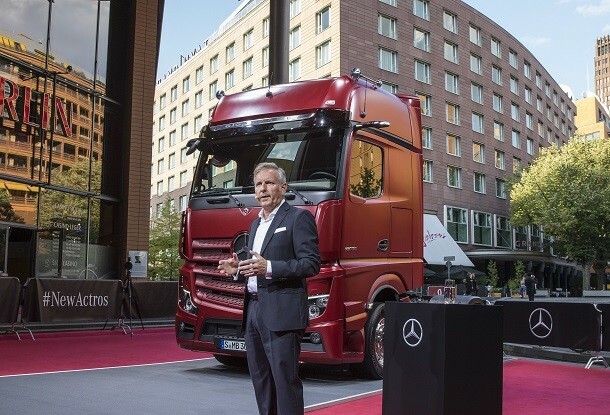 It is in Berlin (Germany), on September 5th 2018, that Daimler unveiled the fifth generation of Actros. Thanks to lots of technology input, this version is headed to the future. Production will start in April of next year. During the presentation, the audience has witness the absence of lateral rear view mirrors on the outside (those for blind spots are still there). The mirrors are replaced by cameras. This innovative system, called MirrorCam, allows the driver to see the images on screens in the cab. The cameras can also spot fuel or freight theft. It is possible to order the classic rear view mirrors to adapt to regulations that don't accept such systems. In the cab, the takeover has been revisited. No need to use lots of buttons and make way for two intuitive tactile screens. The new Actros is equipped with the Active Drive Assist system. It frees the driver from its duty of vehicle's control (braking, acceleration, staying in lane) in certain conditions such as on straight roads, the shallow turns, dense circulation in cities or on motorway. On parle alors de conduite semi-autonome. For a mass produced truck, this is a first on the European continent. In order to complete this safety feature, the Actros also integrates an emergency brake system called Active Brake Assist 5. It anticipates violent brakings by protecting the pedestrians close to the vehicle. Daimler also created a surprise by announcing the arrival (in 2019) of a version using gaz. Up until now, the Mercedes trucks was going more towards the electric energy, but the manufacturer seems to have launched a new challenge.